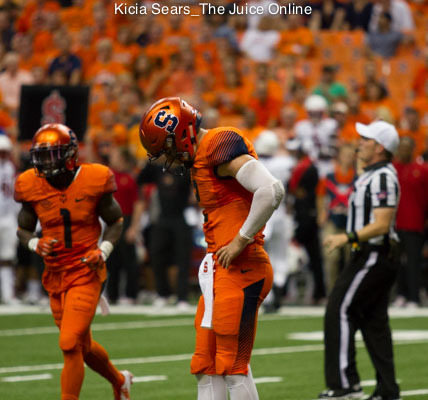 Erv Philips had a day to remember, but it was not enough as Syracuse dropped their second consecutive frustrating game, this time falling at North Carolina State, 33-25. The senior wide receiver set school and ACC records for receptions in a game by hauling in 17 passes, but the Orange (2-3, 0-1 ACC) could not dig all the way out of a first half hole, in large part courtesy of a pile of penalties, particularly a few ill-timed ones. The Wolfpack (4-1, 2-0) dominated almost the entire opening half, opening up a 13-point lead in the first quarter and pushing the margin to 19 by scoring on every drive of the first half, save for their final possession, which ended on a missed field goal in the waning seconds. SU, in contrast, looked like the superior team in the second half, particularly the third quarter, when they chipped ten points off the lead and allowed a single first down. As they did the week prior at LSU, Syracuse made it a one-possession game late in the fourth, but were undone again by a failed specialty kick, this time an onside try that the ‘Pack easily scooped up. The hosts needed just over ten minutes to open up a 6-0 lead as they cashed in on field goal tries on their first two possessions. The Wolfpack actually ran 24 of the game’s first 26 plays, notching one three-pointer after the opening kick, picking off Eric Dungey on the Orange’s second play from scrimmage, then adding another trey. SU’s second drive was more successful, but bogged down and produced no points when Cole Murphy’s 48-yard field goal hooked left of the uprights. 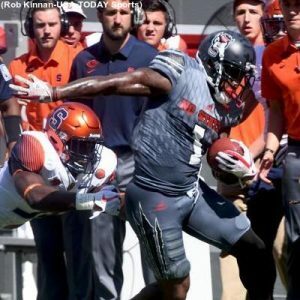 N.C. State struck back on the ensuing drive, taking advantage of a pair of Syracuse penalties as they marched for a touchdown to strengthen their grasp on the game to 13-0 with 25 seconds left in the first quarter. Erv Philips made himself a factor on the following possession, catching five passes, including on four consecutive plays to set up the Orange score. Dungey kept the ball on a draw play, bolting left and spinning away from a tackler before getting into the corner of the end zone. Murphy tacked on the conversion to bring SU within 13-7 less than three minutes into the third. The Wolfpack responded with another touchdown drive, going 75 yards in five plays. The extra point was missed, however, making it a 19-7 game. SU responded with another solid drive, highlighted by a 47-yard catch-and-run by Moe Neal, who motioned out of the backfield and caught a pass down the left sideline and rambled into field goal range. On fourth-and-one, Dino Babers opted to have his charges go for it, but Dungey was stuffed at the line, giving the ball back to N.C. State midway through the second. The hosts took advantage of another flag on Syracuse, this time a defensive holding that wiped out an interception by Scoop Bradshaw. A half dozen plays later, the ‘Pack added another touchdown, pushing their lead to 26-7 with just over two minutes left in the opening half. The Orange could do nothing with their final possession, as the drive was short-circuited by a holding flag, and they punted back to N.C. State. The Wolfpack needed just over a minute to move 56 yards, but a 31-yard field goal on the half’s final play missed, sending them to the locker room with a 19-point lead. SU opened the second half clicking, as they needed just over three minutes to score. Steve Ishmael had the key play on the drive, pulling in a pass on a stop route on fourth-and-two, then rambling for a 38-yard gain to the hosts’ five-yard-line. On third-and-goal, Dungey burrowed into the end zone for the touchdown and Murphy’s extra point cut the gap to 26-14. Midway through the period, Syracuse took over at their own 11. Dungey was sharp on the drive, converting a third-and-13 with a 17-yard pass to Philips and rifling a 32-yarder to Ishmael on the following third down to get inside the Wolfpack 30. The Orange reached the eight, but an illegal formation penalty wiped an Ishmael touchdown grab out of the books. On the following play, Dungey scrambled to the five, but center Airon Servais was flagged for a personal foul after the play for a retaliatory push that was embellished by the N.C. State defender, who fell backwards to the ground. Backed up to the 20, Babers opted for a field goal and Sterling Hofrichter connected on a line drive from the left hash from 38 yards away to cut the deficit to 26-17 with 2:28 remaining in the third. On their first possession of the fourth quarter, N.C. State drove for a touchdown, chewing up just over five minutes as they pushed the lead back out to 33-17 with under ten minutes to play. SU took advantage of a short kickoff to drive into Wolfpack territory once more, their drive extended by a 22-yard scamper by Dungey on fourth-and-four. When the next set of downs hit fourth, Babers dialed up a trick play. Just as they did against LSU, the Orange tried a jet sweep pass by receiver Devin C. Butler, only this time the pass was incomplete, just beyond the reach of Ravian Pierce, giving the ball back to N.C. State midway through the fourth. The Syracuse defense rose up, forcing a quick punt, and Sean Riley came through with a 34-yard return, setting up the offense at the Wolfpack 33. Five plays later, Ishmael pulled in a ten-yard touchdown pass. The Orange went for the two-point conversion and succeeded when Dungey faked a handoff and dove across the end zone stripe on the left side. SU trailed, 33-25, with 4:39 left. Babers dialed up an onside kick, but it was directly to a Wolfpack player, who swallowed it up at the Syracuse 47. Two first downs later, the ‘Pack was able to bleed out the clock and escape with the win. Erv Philips had a career day, catching 17 passes for 188 yards, blowing by the previous team record of 14 catches, which he shared with Art Monk. Steve Ishmael had six grabs for 120 yards and a score, marking the fifth consecutive game where he logged at least 100 receiving yards, which ties the school record set last season by Amba Etta-Tawo. In addition to his two rushing scores, Eric Dungey rang up 385 passing yards by completing 30-of-47 passes, including one touchdown and one interception. Dungey now holds the school record with eight 300-yard passing games. Parris Bennett led the defense with 13 tackles and also forced a fumble. Zaire Franklin chipped in with 11 stops and a pass breakup in the game. Three different defensive backs (Scoop Bradshaw, Devin M. Butler, and Christopher Fredrick) each were credited with a pair of pass breakups. 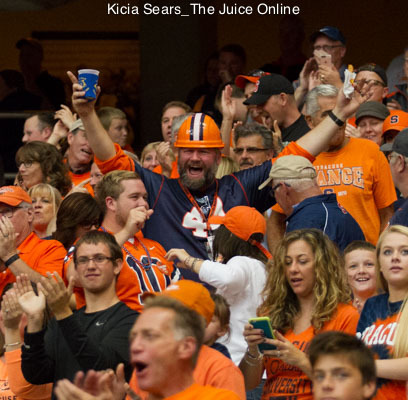 Syracuse returns home next Saturday when they will welcome Pittsburgh to the Carrier Dome for Homecoming. The Panthers (2-3, 0-1) snapped a three-game slide when they handled Rice at home Saturday, 42-10. Max Browne sparked Pitt with four touchdown passes as he completed 28-of-32 passes for 410 yards. Kickoff is set for 12:30pm Eastern and the game will be televised regionally, as well as available online through ESPN3.